The New Day has had a great run. Nobody expected this band of three fun-loving rascals to be the longest reigning tag team champions, and then be part of the special movement known as #KofiMania. But the trio has stuck around for the long haul, even when their critics have wanted them to split up. Words like 'stale' have been thrown around many a time. But I do think that The New Day will split up, come the current edition of the Superstar Shake Up. I will elaborate upon the reasons in this very article. Be sure to share your thoughts and views in the comments too. Do you think it's for the best, that the New Day splits up for now? Let us know in the comments. 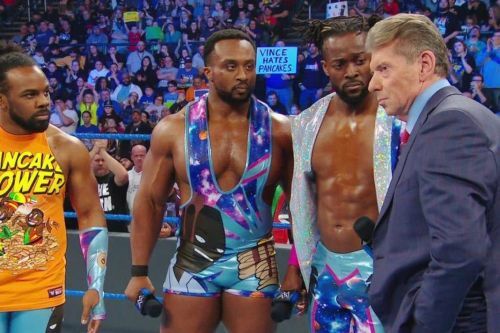 Two men don't make a faction and therefore, I do not see Vince McMahon and WWE keeping The New Day together for the time being. Had Big E not been injured I could have certainly seen them lock it up with the likes of The Undisputed ERA, if they were also called up to the main roster at this time. But the idea of just Kofi and Xavier sticking around seems weird. Let's hope that Big E is able to bounce back and make it back in time so that he doesn't lose the momentum that he has. But WWE should use this opportunity to try and push Xavier Woods as a performer on WWE RAW too, while Kofi Kingston rules the roost on SmackDown Live.